Chiri is a very versatile sheet of decorative paper from Japan from a mix of kozo and sulphate fibers. The cream-toned paper has a chain-line pattern which runs parallel to the long dimension of the sheet. The small irregular bits of bark inclusions scattered throughout give the paper a very organic & decorative look. 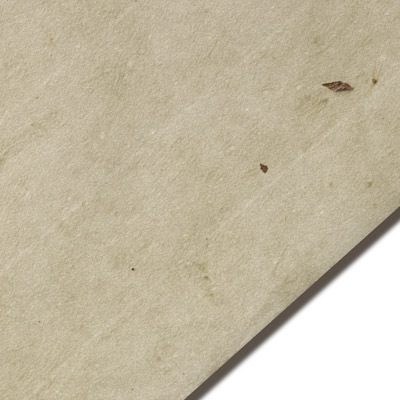 The paper is slightly translucent with a cloudy and mottled formation; it is also noticeably two-sided (smooth and a slight vellum texture) which is not an unusual characteristic for a lightweight Japanese sheet. Considered a favorite of lampshade designers and manufacturers who laminate the paper to styrene for shade production. This paper is also used for deluxe packaging and gift wrap as well as being suitable for flyleaf or end-leafs in limited edition books and albums. It also recognized as an ideal envelope liner for stationery convertors.